PDP chief Mehbooba Mufti used an emoji of Pinocchio to take a jibe at former J&K CM Omar Abdullah on Twitter calling him out for "spreading fake news". Twitterati enjoyed the funny conversation online. 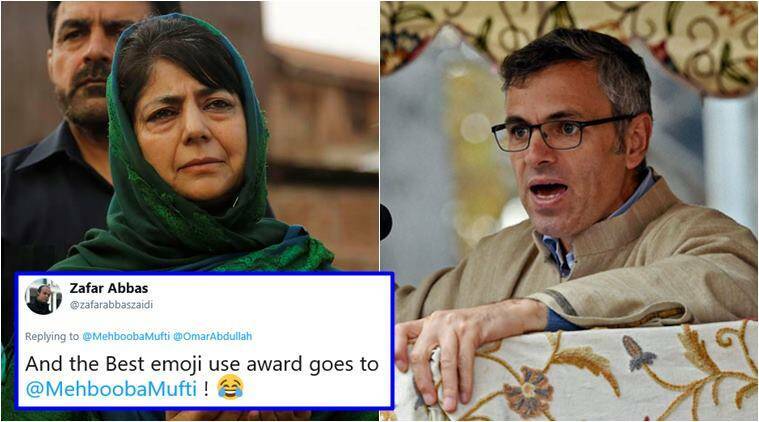 Former Jammu and Kashmir chief minister Mehbooba Mufti use of an emoji to counter her political rival and National Conference leader Omar Abdullah left Twitterati impressed! On Tuesday, Omar Abdullah claimed that Mehbooba Mufti promised both — BJP and Congress — that she would support their respective candidates for the post of the deputy chairperson in Rajya Sabha. “How does that work exactly?” asked Omar on Twitter. The PDP chief was quick to respond. Showing her sense of humour on the micro-blogging site, Mehbooba chose to reply with an emoji of Pinocchio. Pinocchio, the famous puppet from Carlo Collodi’s novel, sees his nose growing every time he lies. Mehbooba Mufti, though, was not going to let the credit for her imaginative social media skills go to a social media executive, “Again fake news! Give a compliment where its due Omar,” along with another emoji. Again fake news ! 🤦🏻‍♀️. Give a compliment where its due Omar . Twitterati found the conversation quite hilarious and couldn’t stop taking a note of Mufti’s emoji game. What do you think about their Twitter chat? Tell us in comments below.